Now what am I gonna do with my life? Bob Johansson didn't believe in an afterlife, so waking up after being killed in a car accident was a shock. To add to the surprise, he is now a sentient computer and the controlling intelligence for a Von Neumann probe. Light, fun and easy read. An io9 Can't Miss Science Fiction and Fantasy title in March 2014. Martin Banks is just a normal guy who has made an abnormal discovery: he can manipulate reality, thanks to reality being nothing more than a computer program. With every use of this ability, though, Martin finds his little “tweaks” have not escaped notice. Rather than face prosecution, he decides instead to travel back in time to the Middle Ages and pose as a wizard. An American hacker in King Arthur’s court, Martin must now train to become a full-fledged master of his powers, discover the truth behind the ancient wizard Merlin…and not, y’know, die or anything. ©2013 Scott Meyer (P)2013 Brilliance Audio, all rights reserved. 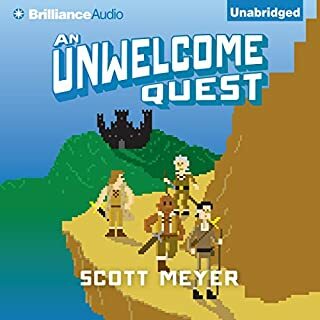 If you want a half-decent comedy fantasy plot with some good cultural references and half-hidden grade three humour read by a narrator who REALLY gets the ridiculousness of the book, then this is the audio book for you! If you don't like that, well... you probably wouldn't have looked at the book anyways. 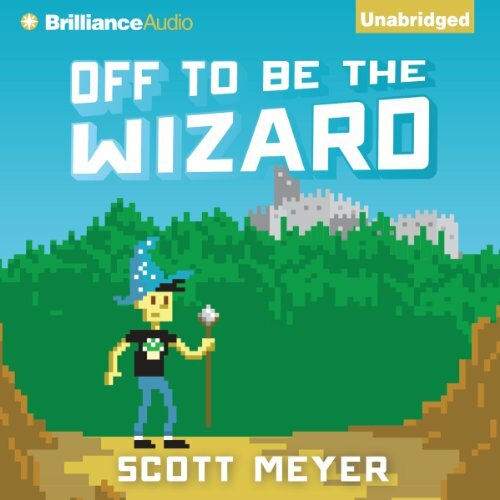 Off to be the Wizard is about Martin, a young man who stumbles across a computer program that turns out to be the code of the universe (or at least, Life), which he finds out he can manipulate to suit his needs, or more accurately his wants. Think physical characteristics, time travel, and teleportation. This naturally leads to bank fraud and an escape to England in 1160. Naturally. What do you do in medieval England when you have the power to control anything and everything? 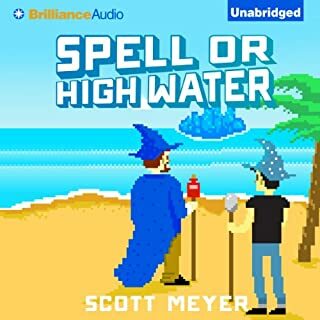 Try to become Merlin, the most famous wizard in the land. Except Martin really can't control his newfound "powers" all that well and the locals are not that impressed. Because they already have a wizard. Actually, they have a few. What follows is a grand adventure full of hi-jinx and disaster until one wizard is found to be manipulating local villages to create his own version of Middle Earth (ok, that one threw me for a loop, I didn't expect the whole plot - which had seemed so original - to hang on something like that). Epic battles ensue, surprises are surprised, and twists are twisted. The plot was funny, the flash-forwards to Martin's parents were good and the concept of a bunch of computer hackers faking magical powers to escape the law in their own time was fun. That said, I thought the book could have stood on it's own without the main antagonist resorting to Tolkein (the rest of the cultural references were nowhere near as key to the plot) and there were a few characters I would have liked to see developed more. The narrator was what made this book - Luke Daniels was HILARIOUS and really played up the wizard voices. His inflections and acting fit the silliness of the plot perfectly, while also providing things other narrators don't. For example, when Martin talks with his mouth full and then chokes, Daniels sounds like his own mouth is full of food and that he too is just recovering from something going down the wrong pipe. The narration is definitely over the top, but it works. I will listen to the next book in the series just for Daniels' performance. Luke Daniels can take any story and make it memorable but when he has something as great as Off to Be the Wizard he leaves me completely blown away. 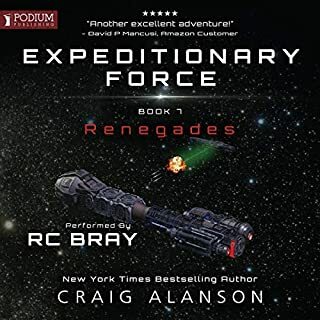 The pace of the story moves along well and the sci-fi concepts are explained clearly enough to not make computer literacy a requirement for enjoyment. The characters are all unique and memorable making it easy to follow each of their stories. A fun story of slightly silly time travelling. I find the Phillip voice rather grating though and a bit too hammy for the character. An enjoyable listen. A really great, fun read. I loved it and my 15 year old son loved it. Laugh out loud funny. Very creative. Extremely well performed. We bought book 2 within minutes of finishing book 1. By itself, the story is ridiculous and crazy in all the right ways. The performance by Luke Daniels puts it on the next level. Absolutely amazing. The voices and timing are great. 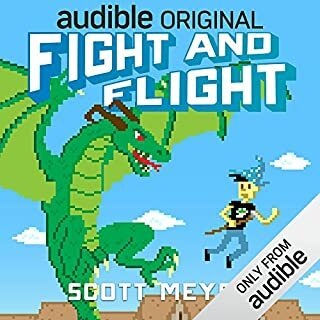 I immediately bought the rest of the audiobooks. When I started this book, I felt some trepidation. I'd heard it was good, but not as good as Ready Player One. But, I wanted to give it a shot. The first part of the book was infuriating - I just kept wanting to yell "How is this NOT a bad idea? Stop being so stupid!". I almost gave up. Then Martin meets Phillip. Suddenly I could not get through the book fast enough. I warn you to be careful if you listen while you drive - there were points when I laughed so hard I almost had to pull over. Luckily, I was in my neighborhood and could go 5 mph. I loved Ready Player One, but this was better in terms of entertainment. I will re-listen to this soon. Luke Daniels kills this - I love what he does with Phillip. Phillip is definitely my favorite. He needs his own series! Ah man, this story was great! Very funny and creative. It has a rather modern feel to it, along with a healthy reaction to existentianlism. Definitely believable in it's explanation of coding as a form of magic and the modern and midevil perspectives are interesting. All in all very compelling and enchanting story. I'd reccomend it to anyone who likes a good story. 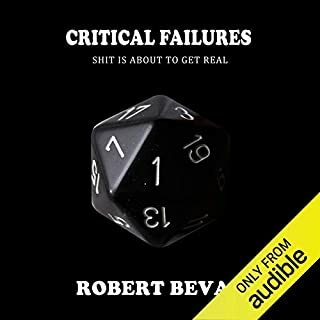 This series fell into my lap as a suggestion in the Podcast’s Youtube page. I really appreciate that, as it keeps me from having to seek out books blindly. 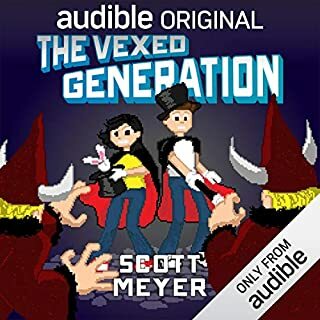 Let me say, I hadn’t heard of Scott Meyer before this book, but this cat is on my radar now. The man knows how to set up a story, and make it funny. The tale revolves around a guy who discovers a small piece of code that makes him realize that he is living in a computer program, and that he can manipulate the system. In other words, there is no spoon. He can rewrite some of his code and provide all kinds of benefits to himself such as making himself taller, teleport, or wealthier by inflating his bank account, etc. Naturally, this leads him into getting himself into trouble with the law, and before you know it he flees to the past where he plans on setting himself up as a wizard. Now, we all know that nothing good comes from thinking like this, and that things are not going to go as planned. 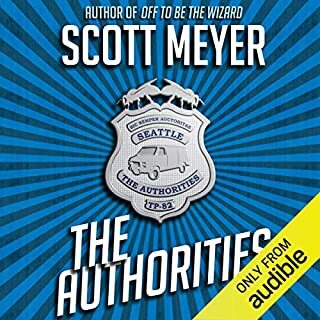 Still, the book really takes off and there is a ton of magic, time travel, thugs, FBI types, and wizards to keep you entranced before you know what hit you. Meyer never misses a beat, and has a built in rim shot that appears every couple of beats to make you laugh. It is a good mix of funny, ironic, satire, and seriousness that all blends together in one hell of a sweet literary smoothie. 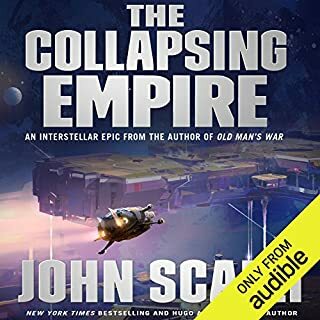 I looked and there are quite a few books in this series, and I look forward to getting my grubby mitts on each one, just as much as I do other big names in the Litrpg genre. 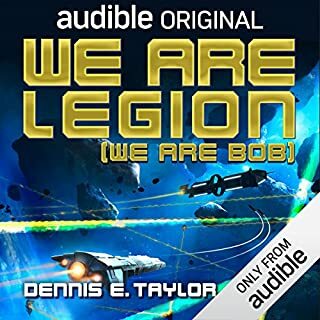 One huge benefit for this series is that the book is narrated by Luke Daniels, and like Jeff Hays, I don’t think I’ve ever heard a book that he narrated that I didn’t love. Daniels proves to be as professional and silly as a person can be simultaneously. I think my favorite part was where he imitated sounding like someone speaking into a fan. That was pure narration brilliance. And his portrayal of Jimmy was soooo funny that I squirted milk out of my nose, and I wasn’t even drinking anything. 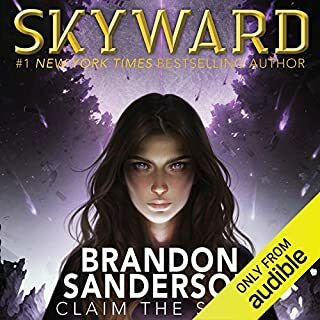 So, the question is is this book LITRPG or not? There are a lot of things to consider, but I’m going to go with two things. First, the wizards are all self aware NPC’s if nothing else. They know that they are algorithms, and it doesn’t bother them at all. Secondly, they are in a computer game. Of that there is no question. They literally rewrite code in order to achieve things that they want. Just on those two things alone I will say this is LITRPG, it doesn’t matter if it was a “real” human who entered the world or if the NPC’s suddenly became sentient. The end result is that the MC is trapped in a Sims like game and regardless of whether he is “alive” he is a player, and that too qualifies. So for this I’m calling it Lit! 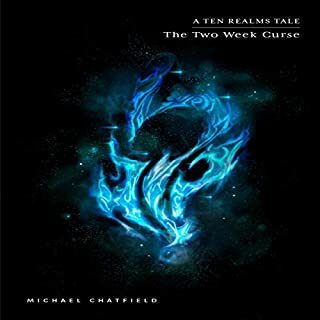 Final score for this Litrpg book is 8.1 stars. 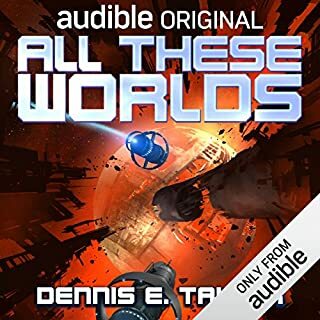 I can’t wait to listen to more of this wonderful series.. Even though I did receive a promo code for this review it in no way influenced my considerations of the material, and in fact, inspired me to be more honest. Getting a code generally makes me harsher as a reviewer as I am more often concerned what someone like Me will decide based on my review. JUST BECAUSE YOU CALL SOMETHING, SOMETHING, DOESN'T MAKE IT, IT. 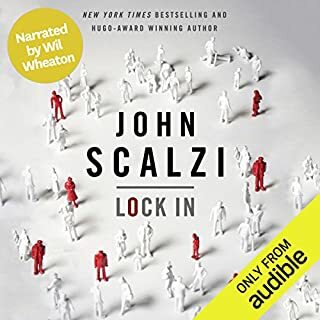 If you like John Scalzi and Wil Wheaton, then you will love this. During the first hour, I thought this is cute, but it is going to grow old. Over nine hours later, I am still laughing. As the story grows, it gets funnier and more interesting. If you are driving be careful, you may miss your exit, it is that engaging. SILENCE SO THICK, YOU COULD LEAN ON IT. I can not say enough about Luke Daniels. His performance is above and beyond. This would be a great book to read, but I believe that Daniels makes it so much more. Don't miss out on this experience. HAVE YOU EVER SEEN ME EAT ANY OF THAT STEW? I will be getting the sequels. The opening of the book had me worried... it was sloppily written, in fashion to get the plot moving as quickly as possible. The protagonist isn't well thought out... he's smart enough to be an elite hacker, but his intelligence is otherwise absent from anything he does thereafter... for the entire duration of the story. The character discovers that he has the powers of a god, but this is quickly forgotten by both him and apparently the author. Like in the movie "Bruce Almighty", we're supposed to believe that our character is so unimaginative and selfish that the only thing he can think to do with his powers is to improve his own little life in small and insignificant ways. But before you can get to frustrated with the story, Meyer throws you backwards in time, and the story takes a turn for the weird(er). Here in the past, Meyer has thought things out a little bit more. If he researched the time period, it doesn't really show... but he has built an amusing cast of characters. Here the book starts to take on the flavor of Cline's "Ready Player One", one of my favorite light reads. 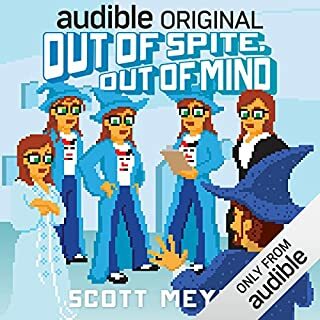 Meyer's characters are funny, and the humor is geared at an audience who is familiar the life of 1980s computer geeks. Everything stays fun and light. I wasn't bored for an instant. Oh, and the narration was hilarious. The ending was satisfying within the scope of the story... but then, the scope of the story was very small. As a listener, what I really longed for was for our hacker protagonist to play around more with the code he's discovered... outside of this one little pocket of use that he's fixated on in the past. Play with more variables... discover things... surprise me. Anyway, Meyers has a lot of promise. I hope that he continues writing... and that next time he takes his writing to the next level. 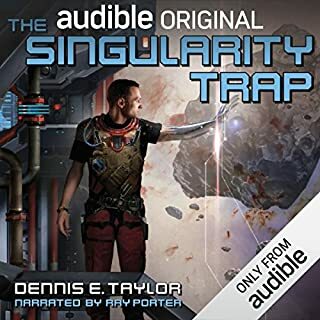 Good listen for the price. I recommend it if you liked "Ready Player One". 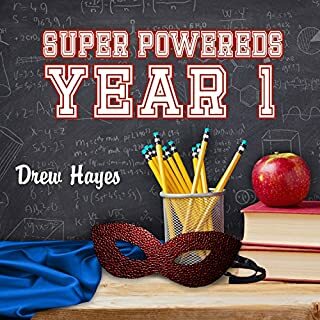 the main character has the worst qualities of three stereotypical high school tropes with no relevant upsides, I stuck it out until chapter 10 but if anything he seemed to lose competence as he progresses to boot. A Geekfest of good times. I found this book because my favorite narrator, Luke Daniels, is reading. As an added bonus, I also fall into the demographic--White girl nerd who started with tech in the '80s. Now, I know that previous viewers have said this is more for guys, but that is untrue! In life, I've found, nerd > gender. While we may not make the "obvious jokes," we have certainly heard enough of them to make us smirk when the obvious jokes pop up...so to speak. Oops, I think I just broke the first rule of Magic. But I digress. 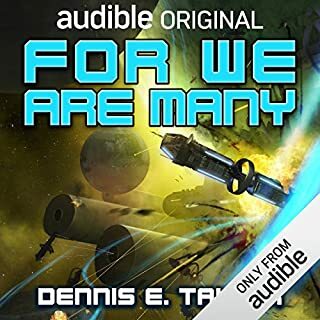 Mr. Daniels' narration was perfection, as always! The storytelling was nimble, witty, and filled with nerdtastic goodness. Unlike another reviewer, I found Martin's reactions to be completely believable and probable, considering the circumstances. I also thoroughly enjoyed the bits of nostalgia. All in all, a highly recommended read! This is not a well-written book. For the first quarter of it, that’s part of its charm. Meyer is so clever, so warmly funny, that he powers through not quite knowing “the rules” of writing a novel. Our hero, Martin, discovers an obscure data-set on the internet, one that includes his name along with millions of others. He changes his height, out of vanity, from 5’10” to 6’1” and realizes he’s changed his actual height. He realizes, that is, that he’s found the database of existence, and that he can alter his personal statistics as he pleases: his wealth, his location, his place in time. Meyer gets through all of that background quickly and without pretension. Martin realizes his powers, gets into trouble, and flees to what he thinks is the security of medieval England, in only 50 pages or so. Meyer is so inventive and brings so much joy to his task, that it’s hard not to get caught up in the fun. The second and third quarters slow down considerably, though, and the final quarter more or less hits a wall. A couple chapters of Martin training with another “wizard” might be nice, but more than half the book on that is overkill. And, as all that unwinds, there’s no real plot left. The final part means exaggerating a minor conflict into the central one, and there’s really little at stake. Still, reading this hasn’t been a disappointment. I’ve enjoyed it, in substantial part, because its what-the-hell approach makes me appreciate the art of several other books all the more. 1)	Claire Norths’s The First Fifteen Lives of Harry August is really a gem, one of my favorite surprises of last year. It too tells the story of characters who play with time lines, but it takes its potential contradictions more seriously and answers them with deeper wisdom and care. When I find myself wondering here, for instance, why no changes in the past affect the future, I admire North’s subtler answer to that, where individual choices in the past can slightly alter the future – changing an individual’s wealth maybe – but not dramatically: no forestalling Hitler’s rise. North’s is a joy of a book, one that rises well above this one, and it’s rewarding to be reminded of it. 2)	Mark Twain’s A Connecticut Yankee in King Arthur’s Court is actually about something. Where Meyer’s book sets out to entertain, or maybe to make a kind of revenge-of-the-nerds claim, Twain uses almost the exact same setting to make an argument about the nature of modernity. As far back as 1889 Twain saw some of the dehumanizing aspects of technology. His hero shows up some of the foolishness of chivalry, but, in the end, he shows all the more clearly the Holocaust potential of the industrial world. It’s an argument about human nature, one that’s far more deeply funny than this book, and one that’s simultaneously disturbingly predictive. 3)	Any number of genre novels I’ve read recently do what they set out to do. The hero saves people, the heroine falls in love with him. 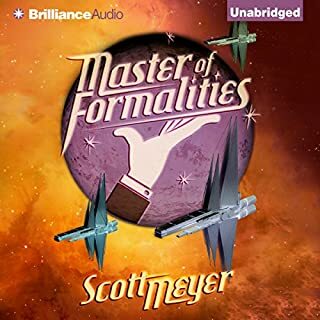 Meyer tries to subvert the formula, his love story never gets off the ground and his Gandalf/Dumbledore figure is decidedly silly, and he gets some legit laughs out of it. Still, he’s clearly playing against expectation. When Charlie Huston or Jason Starr tells a good story, one where character types walk in the door in the opening pages, it’s all the more impressive to realize they’ve held my interest while obeying the demands of genre. I have no plans to read any more Meyer, and I can’t recommend this one in good conscience, but I feel oddly good about having read it. This writing business is tough. It’s hard to get it right, and Meyer, in getting a lot wrong, reminds me of the joy and optimism I feel any time I sit down in front of a brand new blank page. I don’t know why I picked up this book. I am a straight fantasy reader and this book has no real magic. Fortunately, I decided to check out the sample (for some reason I can’t fathom) and I could not put it down. This is now in my top favorite books of all time, and the only one without magic. I literally cannot believe how much I loved it. The humor is fantastic, the writing is brilliant, and the story is captivating. I can’t say I didn’t spot the villain from a mile away, but reading it was the most fun I’ve had in a long time. Every single day, I looked forward to getting my work done because it meant I could read more of this awesome book. There is nothing I didn’t like about it. I am a huge fan of the author. I look forward to reading everything else he has and ever puts out. Now, a book and a narrator can be amazing on their own without fitting together. In this case, the narrator could not be better suited for the book. He understood and performed the humor and characters’ personalities perfectly. His voice and production quality were great, making it easy to listen to it for hours on end. The premise is excellent but the main character was enough of an unlikable idiot that I lost all interest in hearing how his story turned out.